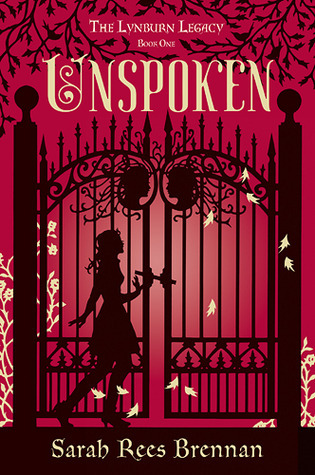 Review: Rees Brennan lets her love for gothic romances and lady sleuths shine through in Unspoken, and I heartily approve of the combination. Kami and her friends are a delight (particularly Angela), and I enjoyed their antics as they tried to uncover the mysteries around the Lynburn family. Most of the teenage characters in the book were a lot of fun, but I’ll be the first to admit that I cared very little for the adults. The humor in Unspoken left me with mixed feelings. Rees Brennan’s characters have a lot of witty banter, but the humor didn’t often strike a chord with me. (I felt much the same about her Demon’s Lexicon series, which is a shame, as I really enjoy the author’s tumblr.) The ending was not very satisfying for me for several spoiler-y reasons, but I truly enjoyed the last-minute emotional sucker-punching that has had most of Rees Brennan’s fans in a tizzy since the book came out. Recommendation: Get it soon, if gothics and mind-reading romances are your thing. If not, borrow it someday, because the Lynburn Legacy trilogy has a lot of promise. I have high hopes for the second book, which comes out later this year.